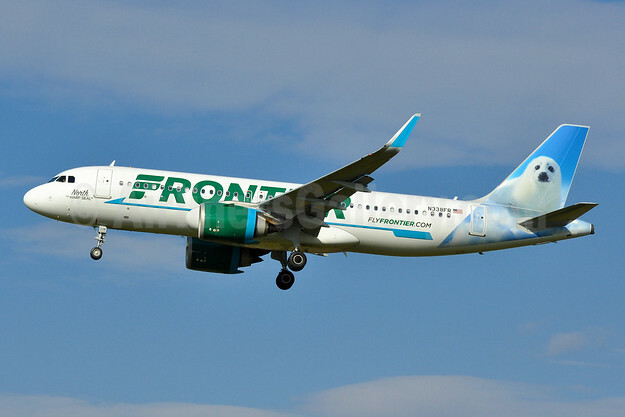 Frontier Airlines has announced the addition of new non-stop service from Denver International Airport (DEN) to Baltimore-Washington International Airport (BWI), Fort Lauderdale-Hollywood International Airport (FLL), and Bradley International Airport (BDL) in Hartford, Conn. Service will begin in March 2019. Depart DEN 12:35 p.m. Arrive BWI: 6:07 p.m. Depart BWI: 6:57 p.m. Arrive DEN: 9:09 p.m. Depart DEN 11:51 p.m. Arrive FLL: 5:47 a.m. Depart FLL: 7:30 a.m. Arrive DEN: 10:01 a.m. Depart DEN: 7:00 a.m. Arrive BDL: 12:50 p.m. Depart BDL: 1:40 p.m. Arrive DEN: 4:07 p.m.
Top Copyright Photo (all others by the airline): Frontier Airlines (2nd) Airbus A320-251N WL N338FR (msn 8402) (North, the Harp Seal) PHL (Tony Storck). Image: 944794. This entry was posted in Frontier Airlines (2nd) and tagged Airbus A320-251N WL, Frontier Airlines (2nd), msn 8402, N338FR, North the Harp Seal on December 18, 2018 by Bruce Drum.